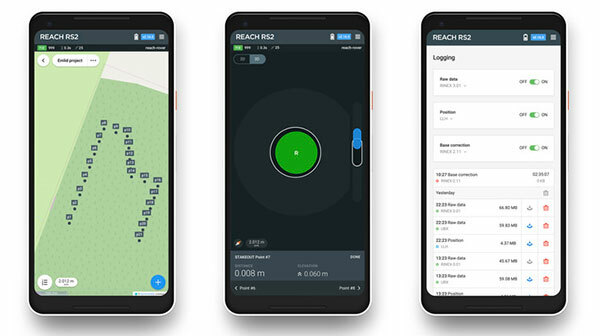 Emlid, the creators of Reach, centimeter-accurate RTK GNSS receiver, is now taking pre-orders for its multi-band GNSS receiver Reach RS2. The new receiver features built-in LoRa radio, 3.5G modem and a survey app for iOS and Android. L1/L2/L5 RTK GNSS receiver with centimeter precision. 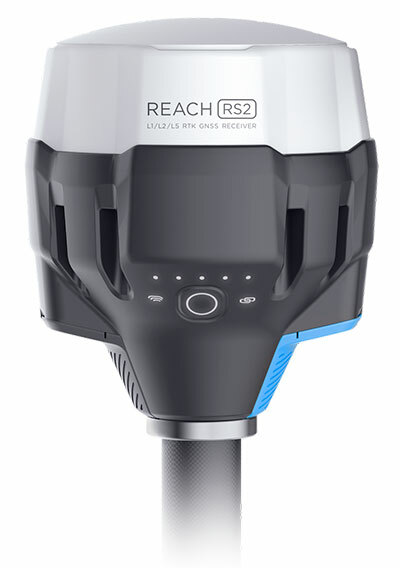 Reach RS2 determines a fixed solution in seconds and provides positional accuracy down to several millimeters. The receiver tracks GPS/QZSS (L1, L2), GLONASS (L1, L2), BeiDou (B1, B2), Galileo (E1, E5) and SBAS (L1C/A), and reliably works in RTK mode on distances up to 60 kilometers and 100 kilometers in PPK mode. A multi-feed antenna with multipath rejection offers robust performance even in challenging conditions. RINEX raw data logs are compatible with OPUS, CSRS-PPP, AUSPOS and other PPP services so users can now get centimeter-precise results any place on Earth. Built-in 3.5G modem and UHF LoRa radio. The Reach RS2 features a power-efficient 3.5G HSPA modem with 2G fallback and global coverage. The corrections can be accessed or broadcast over NTRIP independently, without relying on internet connection on a smartphone. For remote areas, the Reach RS2 has a built-in LoRa radio that has proven to be a reliable link for RTK corrections for distances up to 8 kilometers. Designed for Tough Conditions. The Reach RS2 is engineered to be waterproof and impact-resistant. Its body is manufactured in a two-step injection process and is made out of shockproof polycarbonate covered in a special elastomer for extra protection. The receiver has an industry-standard 5/8-inch mounting thread. The LiFePO4 battery of the Reach RS2 is designed for 16 hours of work as a 3.5-G RTK rover on one charge regardless of weather conditions. It can charge from a USB wall charger or a power bank over USB-C.
A RS232 interface allows users to connect the Reach RS2 directly to external hardware and output position in NMEA. ReachView App. The Reach RS2 comes with a mobile app, ReachView for iOS and Android, that is used to control all the features of the device. Users can create projects, collect and stake-out points, and import and export geodata in industry-standard formats such as CSV, DXF and Esri Shapefile. The Reach RS2 comes in a carrying bag with a USB-C cable and a LoRa radio antenna. The ReachView app is available for download from Play Market or App Store. See the full specs and pre-order Reach RS2 on Emlid website.